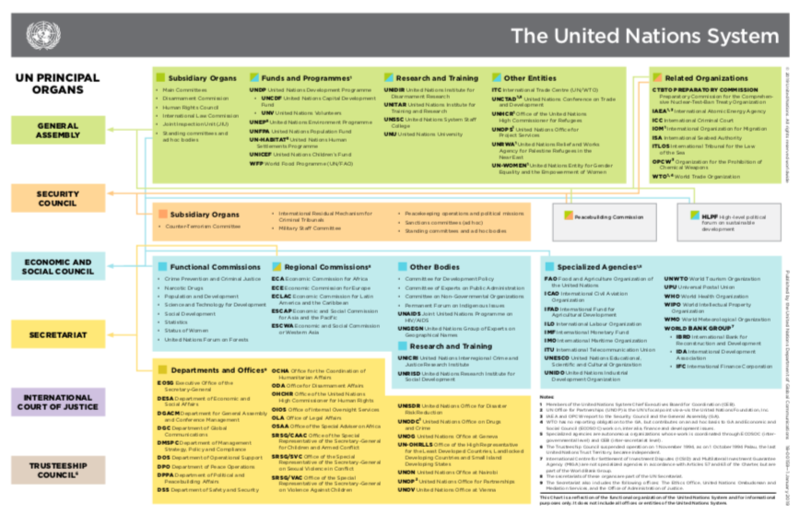 On 20 June 2018, the United Nations Postal Administration (UNPA) issued six stamps and three souvenir sheets to celebrate UNISPACE+50. UNISPACE+50 is a special segment of the sixty-first session of the Committee on the Peaceful Uses of Outer Space that was held from 20 to 21 June 2018 in Vienna. UNISPACE+50 celebrates the fiftieth anniversary of the first United Nations Conference on the Exploration and Peaceful Uses of Outer Space, and takes stock of the contributions to global space governance of the three UNISPACE conferences, held in Vienna in 1968, 1982 and 1999. It is also an opportunity for the United Nations Member States, permanent observers, United Nations entities, space agencies, NGOs, academia, civil society students, the private sector and industry to gather and consider the future course of global space cooperation for the benefit of humankind. This special event aligns not only with the ever-growing importance of space applications and technologies for humankind, but also with global efforts, goals and targets to end poverty, protect the planet and ensure prosperity for all, particularly under the 2030 Agenda for Sustainable Development, for which space can be a valuable tool. The high-level segment was preceded by the UNISPACE+50 symposium for the broader space community, with panel discussions on topics such as “space for women”, “space and industry” and “space and youth”. 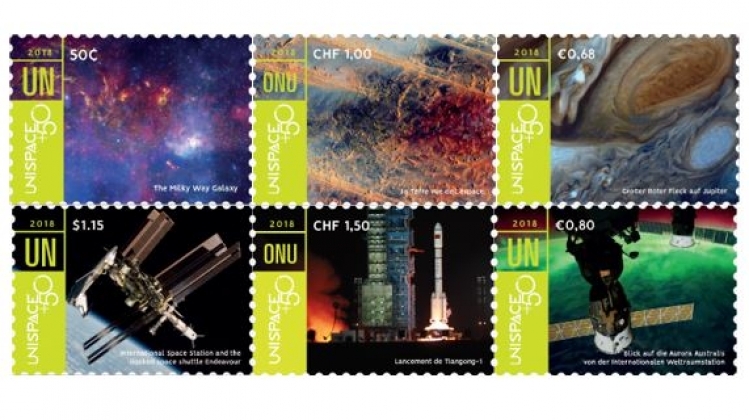 In honour of UNISPACE+50 and to celebrate more than 50 years of international cooperation in the peaceful uses of outer space, UNPA is releasing a series of stamps that represent humankind’s achievements in space, and the benefits that space exploration brings to all of us here on Earth. The stamps include images of human space flight and space technology, Earth, space exploration and studies of space. 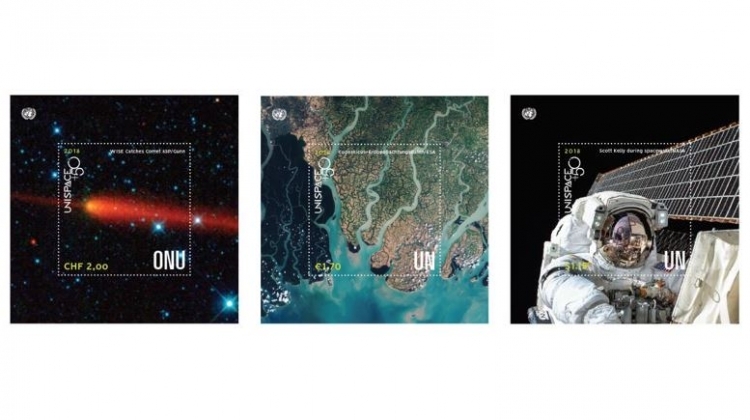 The images on the stamps and souvenir sheets were supplied by the United Nations Office for Outer Space Affairs (UNOOSA) and were designed by Sergio Baradat of UNPA Graphics Design Team. To purchase these stamps or other UNPA products, please visit unstamps.org or the UNPA stamp shops in New York, Geneva and Vienna. Follow UNPA on Facebook, Twitter and Instagram.